Financial firm Skandia has confirmed it will pull the plug on its sponsorship of the world's most prestigious sailing regatta, Cowes Week. The FTSE 100 company, which has its UK headquarters in Southampton, said it will not renew its multi-million pound deal when it expires in 2009. 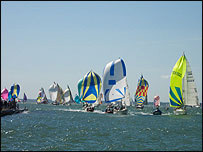 Skandia will have sponsored the 180-year-old event in the Solent, off the Isle of Wight, for 14 years. Thousands of people, from Olympians to amateurs, sail in the annual event. A Skandia spokeswoman confirmed the company is looking at taking on another sponsorship, but she would not reveal from who at this stage. Stuart Quarrie, of Cowes Combined Clubs, told BBC News: "It didn't shock us at all - by the end of their contract Skandia will have been our partner for 14 years and that's longer than almost any other sports sponsorship around. "At some stage it had to come to an end. "We've got two years to find a new partner and that should be plenty of time."